Today I am starting a new series titled “Tips for Traveling with a Toddler.” I have a few topics in mind already that I will be writing for my Friday posts, and I am sure more will come to mind as I go along. If you have a specific question or situation, please leave a comment and I will see if I can write a post about it to help you get out there and travel with your toddler(s)! 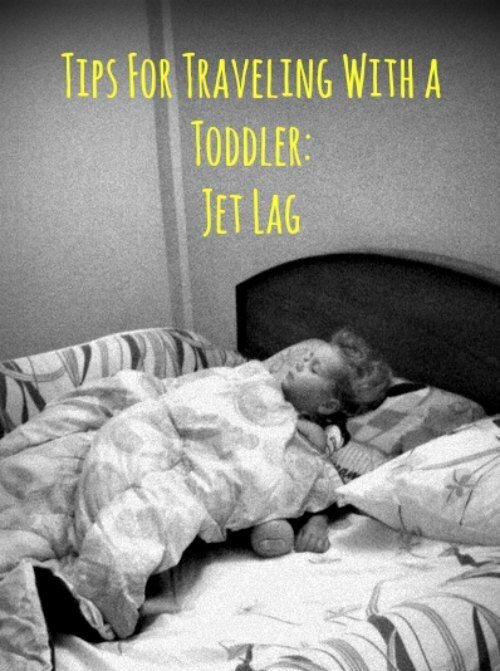 I have seen this tip on many other sites, but there are still people out there on the internet that think that this is not the right way to go about helping a child with jet lag. Do you know what happens when you fly for 7 hours (or more) across time zones with a toddler that is awake the whole time? You end up with a time confused toddler and a very tired parent. If you can possibly get flights that happen while your child is supposed to be sleeping it will save everyone on that flight (and you and your child after) a lot of exhaustion and frustration. It will not only help to give your child rest, but give yourself a chance to rest and get ready for the time change as well. Depending on what airport we are at (safety and busyness are factors) we always take Z to an empty area of the terminal and let her run around to her heart’s content. No sitting, no resting! Just a hard-core work out that zaps all the energy from her tiny little body. I may have gotten some dirty looks for letting my daughter run wild around the chairs in an airport once or twice, but I think those same nasty people would thank me if they were sitting in front of us on the plane. This is the tip that everyone has asked me about. What should one pack for their toddler to do on the flight? Well there are some amazing parents that are creative enough to create games and such for them, like my friend at Journeys of the Fabulist. I am not the most creative parent. And with 30 plus flights in Z’s 3 years of life, I admit I have gotten lazy. I pack things for her that will keep her happy and quiet. Things that I can also relax and maybe read a book on my phone for a bit before attempting to fall asleep myself (remember overnight flights). I am going to write more detail in a future post about what to carry-on the plane for your toddler, but for now I will give you my not-so-secret weapon. Modern Technology! I realize that some parents are dead set against letting their little ones look at screens. I feel you. I was one of you before Z was born, I had the thought that Z would not see a screen before she was two years old. To you parents that have made it that long, I commend you, you are a more amazing parent than I. We started traveling when Z was 22 months old, and I caved on the 2 year time limit for screens. When we left on our adventure, Z had her own iPhone 4 that we had made into a toddler iPod touch. It was filled with educational games for her to play to pass the time on long flights. Judge me if you like, but those games taught her the alphabet, numbers, phonics, and some sight words by the time she was two and a half. My advice, don’t be afraid to utilize the technology you have at hand, whether a smart phone or tablet, or the in flight entertainment. And make sure to read this post for the rest of what I carry-on for Z to keep her entertained. Before we left the USA, we asked a friend that had worked in the Whole Foods Whole Body Department, what could help Z with jet lag as we traveled. She highly recommended Hyland’s Calm Forte (now called Hyland’s 4 Kids Calm n’Restful). Chad and I have always been determined to use natural medicines as much as possible. Not only for ourselves, but also for our daughter. So this product was right up our alley. Hyland’s had been a common brand in our home . We used them during our travels as well. Hyland’s make homeopathic natural remedies for almost everything you can think of. Hyland’s description of Calm Forte for kids is as follows “When your child is not sleeping or resting well, his or her whole cycle goes out of sync. The days can be as restless as the nights! Here’s the medicine that’s trusted by thousands of families who now enjoy long, restful sleeps. Hyland’s 4 Kids Calm ’n Restful brings on the calm and it does not cause any next-morning fogginess, so your child is back in business after a good night’s rest!” I copied this directly from their website and I have to say that this product has worked wonders to combat jet lag, not only for Z, but for us parents as well. Be aware that this natural calming aid is for ages 2 and up. I would say that this is our saving grace almost every time we take a long flight (that and the iPad). None of us has had jet lag when we used this homeopathic remedy. Not only that but one bottle has lasted us a year and a half! It is worth the money. Regardless of what time your child fell asleep on the flight, it is imperative that you wake them up at their normal time in the time zone you are traveling to. For example, our flight from Tokyo left at 10:45 p.m. and arrived in Los Angeles, California, USA at 8:30 a.m.. We woke Z up at 7:45 a.m. California time to jumpstart her internal clock to the correct time. Mind you that Chad and I are were running on very little sleep as well, so we are all a bit tired, but we just assume that the first day will be rough and we will all be a little cranky. The first day in a different time zone can be difficult for anyone of any age. What we have found is it is better to get the hard part out of the way on the first day. Push yourself and your toddler to stay awake the whole first day. This can be very difficult. I admit there have been times that I have let Z fall asleep when she seemed like she needed to, and I have learned this lesson the hard way. It was a much longer time before she acclimated to the new time zone and when she was up all night, so was I. A cranky toddler plus a grumpy mom equals a not very nice time. Do your best to power through the exhaustion that first day and wait to sleep until bedtime. This is self-explanatory I think, and goes along with the last two tips. Your child should be so tired that they fall asleep at their normal (in the new time zone) bed time and sleep through until their regular time of waking the next day. This has almost always worked for our daughter, although there were sometimes that she was up for an hour or two in the night. That was a rare occurrence though, usually she was too wiped out and didn’t even move the whole night. Neither did I for that matter. Make sure that you encourage your child to drink lots of water and eat a well-balanced diet (all the time, but especially right after a long time traveling… airline food IS NOT healthy usually). Jet lag is made worse by lethargy from dehydration and crappy food. So eat and drink well and make sure your toddler does, too. This is pretty self-explanatory. If the above tips for after the flight didn’t work the first day, try again on the second day. The longest it has taken us has been a couple of day before we all felt normal again. Every child is different and some may have no issues, or need a few days to readjust to the new time zone. Good luck and happy traveling! Let me know if you try these tips and how they worked for you!